As we reported last week, Puget Sound Bike Share has officially formed and is currently searching for an executive director. If all goes smoothly, the first bikes could roll out as early as late summer or fall of 2013. Guiding the process process forward is a business plan developed by Alta, which suggested having an administrative non-profit (Puget Sound Bike Share) and a private operating contractor (TBD, though Alta would probably like the job). “Non-profit is a good model for us because it’s a lot easier to apply for public sector grants and [private] sponsorships,” said PSBS Board President Ref Lindmark (also with King County). While elsewhere in the nation, municipalities have owned and operated the systems, a non-profit makes sense for the system’s goal to be a regional system, he said. The PSBS Board includes representatives from Seattle, King County, Washington State, Kirkland, Redmond, UW, Seattle Children’s, Sound Transit, Cascade Bicycle Club, Microsoft, the PSRC and will be looking for more. If all goes according to plan, the initial launch of the system (Phase 1A) will include 50 stations and 500 bikes in downtown, Belltown, Capitol Hill, First Hill, the International District, Pioneer Square, South Lake Union, Eastlake and the University District. Phase 1B will follow, adding 60 more stations and 600 more bikes. At this point, stations will be an average of 980 feet apart, which is about every three blocks, a short walk from any destination within the system area. The start-up cost for the first phase is $3.1 million, with another $1.4 million in operating costs annually. This includes the additional costs buying more expensive bikes with seven gears (typical 3-gear bikes might make it hard on Seattle’s hills) and the cost of providing helmet vending machines at each station. Helmets! I wrote previously arguing for an exception to the King County helmet law for bike share users. The reasoning is that other cities have found their bike share users to be remarkably safe. In fact, it may be the safest urban transportation mode possible and has a far lower injury rate compared to people riding their own bikes. PSBS is not looking for any changes in the helmet law, which would certainly be politically difficult and controversial. However, they are also not ignoring the negative effects a helmet law could have on the network. They have accounted for a lower usage rate and the cost of a helmet distribution system in their business plan, and these expectations and added costs will be reflected in the RFP searching for an operator. “We know that helmet laws will suppress demand and will raise the costs,” said Lindmark, who also pointed out that even many cities without helmet laws are spending the extra money to have helmets available with their systems. Another challenge is the lack of quality bike facilities downtown. This is yet another big reason the city needs to move forward with a downtown cycle track plan (or several) now, so that the facility can be in place next year before bike share launches. Station placement is a challenge for any system, since urban space is precious. There are enough systems in the world that Seattle will have many placement options to follow, including stations on sidewalks, in the parking lane and in public plazas. The system may need legislative help from the city regarding advertisements. While it would look nothing like a billboard or the gaudy ad-covered bikes common in Europe, sponsorship of stations in some fashion is a good revenue option to keep the system going. To be a system member, different pricing schemes have been tried all over the world. PSBS is looking at the tried and true method of offering annual, monthly and daily memberships. PSBS would cost about the same as systems elsewhere, with $5 for a day or $75 for a year (a fantastic deal). What’s the point of bike share? Honestly, I get this question from as many current cyclists as I do from people who don’t bike. Bike share may not really appeal all that much to people who already bike their own rides everywhere they go. But that’s not the point of the system. Bike share is about providing a dependable, fast and affordable way to make short-to-medium-length trips, which are the majority of trips people make. Only 40 percent of people in Seattle have access to a working bike, according to a recent phone survey conducted as part of the Bike Master Plan Update. Transit rates in Seattle are high, and the transit network is very dependent on the downtown transit hub. However, solving the “last mile” problem (from a transit stop to a destination) is very expensive and difficult using buses and trains, and not all these distances are an easy walk. Bike share solves this problem, and revolutionizes the way people interact with their city in the process. This entry was posted in news and tagged bike share, puget sound bike share, ref lindmark. Bookmark the permalink. Have they also factored in the costs of having trucks going to haul bikes from stations at low elevations to those at high elevations? I expect a lot of one way rides would occur. An *annual* cost for 600 bikes of 1.4 million with a set-up cost of 3.1 million? That is $7,500 PER BIKE for the first year alone, each phase keeps about the same ratio. I think at that price we can just hire pedicabs to carry people around. We can CERTAINLY provide helmets at that price. It goes into building the stations, paying the employees who manage the system, repair bikes, redistribute bikes from packed docks to empty ones, wear and tear on bikes (expected to last five years, I believe), paying for right-of-way permits, etc. As a Pedicab rider, I can tell you that our service area fits well inside even Phase I above. Downtown is a terrible place to ride. Will cycle track go in with this? If not it’s going to fail. I think it’s up to us to make sure that happens. We need to be starting that public outreach now so that we can have a design funded and ready to go at the start of next year’s paving season. It’s non profit! They have to spend more than they take in to remain non-profit! I used this in DC a year and a half ago and found it to be a great service. Grab a bike, take it to your destination, and lock it back in. These are bikes you can ride even while wearing business attire. It will be interesting to see how it works here though. These are kind of heavy bikes, and only the most athletic riders are able to make it up our hills from downtown to say Capitol Hill. They should have a station down by the stadiums though. This private non-profit plan seems awfully convoluted and expensive. It also seems to open the door for more ads on the street. Because it is not a public system, it has to adjust to silly anti-cycling laws, such as the helmet law. As the blog said, this not for existing bike commuters. Likely the main users of the system will be transit users going to where they live or work from where transit drops them off/picks them up. This system should be integrated with transit (i.e., bus pass/fare should get you free use of the bike). As such, it should also be owned by Metro Transit, which will have the autority to allocate public space for bike exchange stations. 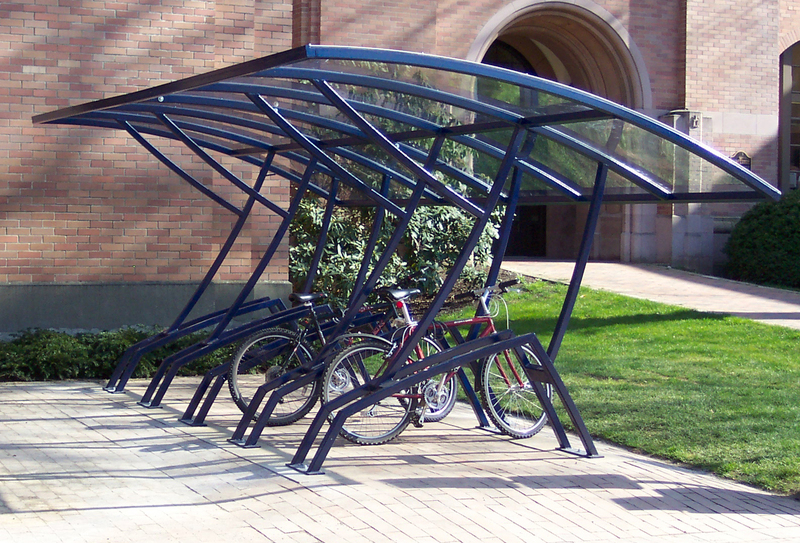 Key to making this work will be “Covered” bike stations so that the seat isn’t soaked when you pick up your bike. Maybe the city could install some regular covered bike parking when they are done. The campus at Western has some really nice covers. This helmet issue is really thorny. The King County helmet law (BOH Code Title 9) makes it illegal to rent a bike to someone who doesn’t possess a helmet. How are they going to verify that someone has an appropriate helmet if the whole process is automated? Presumably this has been addressed by other bike-share programs that make helmets available, but I wonder if there’s additional liability in providing used or shared helmets to riders. The business plan talks about “inspecting” helmets and replacing them (presumably when they are clearly broken, or after some period of time). But helmets can be damaged in ways that aren’t immediately obvious, and it’s likely that shared helmets are not going to be treated as gingerly as we might treat our own helmets at home. Personally, if I really felt like I needed to wear a helmet for my own safety to, say, ride a few blocks between classes, I would be very reluctant to don a used helmet that had possibly been inspected at some point in the past. But I suppose it’s better than not wearing one at all. Here’s a link to the authoritative report PDF: pugetsoundbikeshare.org (PDF). At scale, the project forecasts 2200 bikes supported by an annual operating (not build out) cost of $4.6 million. That’s $2090/bike. It forecasts 2.68 million trips per year at an average of 2 miles/trip. If those numbers are accurate, a trip would cost $1.72. A mile, $0.86. I don’t have a strong reaction to those costs. I would gladly pay $2/trip myself as an entirely usage-based fee. The forecasted cost is in line with Metro and Sound Transit fares. While it’s lower than their costs per boarding (for Metro, $3.70 in 2008; source), the shorter, denser routes are much cheaper to deliver than the system-wide average. The data to compare route-level stats doesn’t exist. Shorter, denser routes are the closest comparables to phase 1. However, one could see bike sharing allowing the last mile. My own conclusion: the costs are definitely “in the zone” for transit and might be a little cheaper than existing options. Crucially, the total cost is incredibly small compared to any other transit implementation, and thereby, much lower risk. As a point of reference, Metro received $37.5 million to add 2 RapidRide Bus Rapid Transit (BRT) routes (source). Even excluding all other revenue sources, the total build out costs of all phases are equivalent to one BRT route. As another perspective, the 4.3 mile Northgate light rail extension has a lifetime budget of $2.1 billion (70x-100x more than the total 5 year projected cost), and the South Lake Union Streetcar was $56.4 million (source). I don’t mean to provide these as comparables. For me, the lower cost just means the barrier for my endorsement is much lower. In urban transit, $20 million is an experiment. In this case, the “experiment” happens to fund the whole system. – relies on internally-created usage forecasts. While the forecasted 2.4 trips/bike in year 1 is within the range seen in other cities, that range is very broad (0.9 to 3.7). As you’d expect of a transit system, usage is the key to a low cost per trip. – ignores the $14.4 million in build out expenses because they do seem to be one-time (stations) or long depreciation (vending machines), and because the report notes “presenting sponsorship is expected to cover all but $2.15 [of] .. $14.4 million.” The unfunded 2.15 million is not a material impact. Source: King County Bike Share Business Plan (2012-01-27), pages 26-27, 36. Hauling bikes from full stations to empty ones is a common issue for all bike share programs, so I’m sure they’ve accounted for it in this one as well. Hopefully they do something like Velib in France and grant people extra time on their bikes past the 30 minute mark for riding to higher elevation stops (a way of reducing the need for trucks to haul bikes around as much), or some other similar incentive program. Better yet, why not just discount people’s fees or actually pay them to move bikes? If I’m looking to go out and get some exercise anyway, riding a few bikes up some hills for the bike share company and making a few bucks (literally, just a few) is something I’d actually consider! I agree that it’d be great if they could integrate with KC Metro, because it’d be amazing if the Orca could be used for both transit and bike share. Moreover, people who get the U-Pass could hopefully pay a small additional fee for access to this. I think you’re mistaken about the private/non-profit route being a mistake though. I’m not saying it’s better or worse necessarily, but public systems like the one starting soon in NYC are also selling advertisements, and guess what? The advertisers are completely covering the cost of implementation AND operation of the program. In Paris the city is actually MAKING money on the program. And to your other point, the fact that it’s not public doesn’t make a difference regarding the helmet law. If it were public they’d still have to follow that law. You should be able to do just that. Login first? Making it work really does require some attention to where and what size the facilities are. When I used it in Boston, I wanted to bike from near the Prudential Center, where I picked up my bike, to Government Center, Quincy Market or Haymarket. Every bike rack near those locations was completely full (except one that didn’t work). I ended up biking all the way back to where I started in order to find a rack with space, which sort of defeats the purpose of the whole project. No! Gigantic heavy step-through frames built of galvanized pipe with upright riding positions, high handlebars and low saddles that put all your weight directly on your perineum are the only proper sort of cycle for a city, haven’t you heard? It is not an athletic endeavor to ride up a hill it is an opportunity to wear a skirt and heels and smile sassily! You people, with your concerns of exertion and gravity, Pah! I understand these systems work well in Europe, but I wonder if they’ve considered the American penchant for vandalism in their business plan? I expect a large number of these bikes to end up stripped, abandoned in vacant lots, or at the bottom of the Montlake Cut after a few weeks. We don’t take care of our things in this country. Other systems in the US have not seen rampant vandalism. One big reason is because the bikes use non-standard parts that have no resale value. Plus, they all have GPS, I’m pretty sure (depends on the operator they choose, I guess, but I think this is standard). So really, there’s little to gain from stealing one. People will trash anything, though, (bus shelters, street signs, etc) and I assume this is factored into the operating costs. Regarding the helmet law, I see where Alta is coming from: keep it simple and just move the ball forward by getting a system out there. However, I really think our helmet law has the ability to make or break bike share ridership. Really it would be helpful if Cascade would be willing to lobby the county to strike down the law. If it were really necessary, they could throw a bone to legislators and agree to provide safety education and helmet use advocacy or whatever. The bike club has so much political power in this city that without them I think it would be hard to make a compelling case to strike or modify the helmet law. I’m not sure Casacde is going to be all that interested. A lot of the call for helmet laws comes from people who ride bikes. I don’t know if Cascade’s membership will like it if they take that stance (but maybe I’m wrong). The case for changing the law comes from a public health perspective, not necessarily a “cyclist” perspective. I think Seattle/King County Public Health should be the leaders on changing the law. If they take a truly data-based approach to reassessing the law (removing emotion from it, which I know is hard), they would see it makes sense from a public health perspective. The big variable in all this is whether SPD chooses to ticket helmetless bike share riders. This is a great example of why it should be a secondary offense (or maybe a secondary offense for bike share only?). SPD should enforce laws for people behaving dangerously and breaking important traffic laws. And if they want to throw a helmet ticket on top of that other ticket, then that’s fine with me. But if someone is being safe and cruising a 3/4 mile from their office to Pike Place Market for lunch, I don’t see the extraordinary danger in them doing so w/o a helmet (especially once we have a safe bike facility for them to use). It’s going to be hard to make that case from a public health perspective, I would think — but I don’t have the raw data, so maybe you’re right. If you read the actual King County helmet law, the justification is that helmet use could reduce the number of head injuries involving bicycling by 69-85%. Has this happened since the passage of the law, after controlling for the increasing numbers of cyclists on the roads? If we’re in that ballpark, then it’s going to be a really tough case to make. Essentially, collisions on bike share bikes are extremely rare in other cities. Helmet laws in general are one debate, but helmet laws for bike share are completely different. They are, for a whole lot of reasons, significantly safer than people riding their own bikes, and this has been proven in several cities. Biking is good for public health. It’s extremely good for reducing the primary causes of Illness (and health care costs), such as heart disease, diabetes, etc. Biking is safe, but bike share is extremely safe, and it’s an easy, accessible way for more people to get a little more exercise (and to potentially reduce car dependency, with all it’s Ir quality problems). So from a public health perspective, the benefits of bike share use FAR outweigh any potential negatives of reduced helmet use. The study you cite has not really been proven or disproven (helmets likely reduce injuries in collisions, but they don’t reduce collisions). When solving public health crises, you don’t make rules to address individual cases, you make rules to address problems on a societal level, using the best information you have to make the best decision you can for the most people. We know bike share works, but we don’t know helmet laws do very much. If we sacrifice the best solution in favor of a lesser one, that’s simply not a good policy decision. I think it’s very unlikely that Public Health would advocate against the helmet law, even though (as I read the studies) this would be a rational position due to the enormous public health benefits of bike riding. It’s much harder to argue that there’s a direct health benefit to an individual bike rider who doesn’t wear a helmet. Health care workers take care of the people who get the head injuries, have strong emotional reactions to these devastating injuries, and want to protect the individuals. I think it would be extremely unlikely for Public Health to campaign against helmet laws. I would rather engage them in promoting Greenways. It amuses me that Renton is on the map but north Capitol Hill isn’t (not to mention Ballard, which is largely pretty flat, and full of bikes). Anyway, the important thing is that this thing is going in a lot of places with challenging cycling conditions. It will shine a light on them and help drive change. Also, the Junction? Columbia City? 23rd/Jackson? Rainier Beach? I think the initial launch areas (Phase 1) are pretty solid. However, once it it running, I would hope that there would be a way for the public to have input on future expansions. Just realized 23rd/Jackson is on there. Awesome! Nice to see Free/Ballard not make the first cut or even the second cut. So those businesses miss out as well as the college. My only comment is that the station location on the Capitol Hill, First Hill and around SU needs some ironing out. I don’t think their placent is right. Unfortunately, they forgot to include: “and where a final destination is too far to walk yet safe to bike to”. I have used Capitol Bikeshare in DC and absolutely love it but Seattle is nothing like DC in terms of geography. Riding a bikeshare bike from the Mall up the relatively gentile incline to Adams Morgan is not something for casual riders. A bikeshare system in downtown Seattle would inevitably become a “coasting system” involving a lot of one way rides from the Capitol Hill and Lower Queen Anne to downtown in the mornings and then from there to Pioneer Square in the evenings. For anyone that lives in Seattle neighborhoods the problem is not getting downtown or getting around in downtown. The problem is getting CROSS TOWN and getting the last mile home from at the end of your downtown commute. 7) THE BURKE GILMAN TRAIL! We shouldn’t be trying to put inexperienced tourists on heavy bikes in downtown traffic. Instead, we should be trying to get SPU students to ride bikes to Fred Meyers instead of driving a car. (Any idea how hard it is to get anywhere from SPU without a car?) We should make it easy for the people moving into the thousands of new apartments in Ballard and the U District (feet from the BG) to get to their bus stop, school, work, the doctor, a park, the library, their favorite bar, etc. without ever getting in a car. That’s where the last mile problem is. I agree that Ballard would be a great place for bike share (and I assume it would be included in a later phase). Fremont is on the list for phase 2. The problem with the Burke is that there are huge stretches of “dead space,” meaning spaces where there are few destinations and homes. It was a train line, after all, and development tended to avoid it rather than build close to it. In the center of Wallingford, you have to climb a very steep hill for a long time to get to any retail destinations, for example. To phrase that another way: You would never build a transit line following the alignment of the Burke because it does not have a good density of housing and destinations. It’s a good cycling route because it’s flat and has relatively few road crossings, letting you cover a lot of ground without needing to stop. But bike share is about trips that take only a few minutes. I saw an analysis from some other large city’s system showing the average length of bike share trips, and they were far shorter than most trips along the Burke. I’ll stick with my assertion that downtown doesn’t need and would be a challenging place for bike share. My emphasis on the Burke Gilman was meant to contrast the grade and safety of the BG with the streets downtown. (Not many hit-and-runs on the BG recently.) My main point is that bikeshare will work best in Ballard and the U district for all sorts of reasons. Stops at Gasworks and Fremont would simply add a few “Well Duh!” obvious stopping places along the equally obvious route between Ballard and the U. This is currently a very underserved cross town link. Seattle has a unique set of problems and will require unique solutions. While mapping out a grid of points in the dense part of the urban core might work in DC or Toronto it is simply wrong-headed in Seattle. Let’s come up with a Seattle-centric solution — one that capitalizes on our long term emphasis on “urban villages”.